We are excited to supply you with state of the art Sanitrax retractable restroom units. 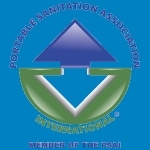 We invite you to contact us so that we may provide you the very best options for your portable restroom company or application. There are countless options available including custom colours, interior amenities such as stainless steel toilet paper dispensers, LED lighting, vanity mirrors, coat hooks, grab bars, corporate branding and top of the line luxury finishes. We are here to help you transform your market into one offering the most ecologically and efficient portable restroom solution available on the market today! Due in part to its fully retractable design and modular features, the Sanitrax sanitary system allows you to optimize space and provides more cost effective transport possibilities. You can therefore have higher efficiency restrooms which take up less space and transport them in less trips; which translates into lower PER unit transport costs and a higher return on your investment. A single Sanitrax unit containing three stalls can now be handled with the same amount of time, effort and energy as a single, old style plastic portable. If you need further information or if you have any questions or suggestions, please don't hesitate to contact us - at any hour! Working together towards a greener planet! The world's first and only patent pending, retractable, containerized mobile restroom unit, housing multiple self-contained toilets that rely on proven vacuum flush technology. A technology that saves up to 90% of the water used by conventional gravity flushing toilets. Environmentally friendly in every aspect, super easy to clean and maintain, fully tailor made to your specific needs, complete retractable concept, most hygienic temporary restroom facility currently available, all built within a strong, galvanized durable containerized frame. A complete sanitary concept containing: toilets, showers, urinals, handwash stations, ADA, VIP and combined units in one standard frame. Your data will be used for answering your questions only and not for any other purpose. Read our Privacy Statement.